Baseball's Reggie Jackson - How He Trained Back Then And Now At 60! 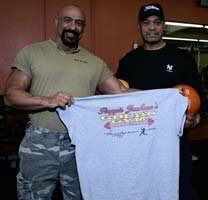 Recently I was having some pictures taken at the gym when my friend, Baseball Hall Of Fame great, Reggie Jackson stopped by. Learn more about who he is, how he used to train, and how he trains now at 60! Recently I was having some pictures taken at the gym, Diesel Fitness in Seaside, Calif. - Drop by sometime if you&apos;re ever in the area. My friend (ex-boss) and a man who is a real inspiration to me walked in. I&apos;m talking about Mr. October, Hall of Fame great Reggie Jackson. I asked him if he would mind taking a few pictures with me. He said "Sure!" A few weeks earlier my good friend and potential co-host and partner Monica Starr was in town and we asked Reggie to sit down and do an interview with Monica and again he agreed. Alright we&apos;re not talking about some bum on the streets! We are talking about a sports immortal! A man who has accomplished much both on and off the field. A man who is constantly badgered for his time and autograph regardless if he is in the middle of dinner or waiting to get his teeth cleaned - Should he say no, he get&apos;s the rap that he is arrogant or words that we can&apos;t put in this article. Nobody seems to be neutral on Reggie Jackson. You&apos;re either a fan or a detractor. One-time teammate Darold Knowles would seem to be in the latter camp. "There isn&apos;t enough mustard in the world to cover Reggie Jackson," Knowles said. Sorry Darold I have to disagree! This article is to give you a little insight to the man I know. Mr. October!!! For those of you who don&apos;t know or were too young (sorry Reggie). This nickname was given to Reggie for playing his best when the games were the most important; example: The World Series, which if you don&apos;t know, is played in October. Reggie Jackson became the first player to win the World Series MVP award (named for Babe Ruth, the only other player to hit three home runs in a World Series game) for two different teams. In 27 World Series games, he amassed 10 home runs, including five during the 1977 Series (with 4 in 4 consecutive at bats, the last three on first pitches), 24 RBI and a .357 batting average. Now that&apos;s clutch ball playing! Reggier hit a career total of 563 home runs, placing him in the top ten of all-time home-run hitters. OK! Reggie has been my boss, my friend, my hero, my idol and even my verbal sparring partner. Of course I never win - he&apos;s always one step faster and smarter than I am. He is the most giving selfless man I know ... as long as he doesn&apos;t feel taken advantage of by bums like me. If this sounds personal, well it is. You can go anywhere to read about Reggie&apos;s accomplishments on the ball field. This article is a testimony to the man I know. However since this is a fitness column. Let&apos;s talk a little about his physical conditioning. This Is A Testimony To The Man I Know. At 60-years young, the physical shape of Reggie Jackson is incredible. OK, he&apos;s had his share of injuries lately. He suffered a back injury a few years ago when he helped an overweight gentleman up, after he slipped in a restaurant. One of the discs in his back had completely disintegrated. Whether this was from picking this gentleman up or if it was the straw that broke the camel&apos;s back, after the rigors of a collegiate football and pro baseball career, we don&apos;t know. but he can only stir it bad." Reggie said he never even made this statement. This is the kind of thing I am talking about. People of greatness always have someone ready to throw darts at them. In my opinion it&apos;s like shooting spitballs at a battleship. He was also injured two years ago while at Yankee Training Camp in Florida when he was rear-ended by a car as he was stopped at a light. He had neck and shoulder trauma. Still his physical conditioning is incredible, the kind of shape someone 20 years his junior would be proud of. Jackson still weighs in the 220 range with no jiggly stuff on him and within 5 lbs of what he weighed during his playing days. Monica asked Reggie if he worked out while he was playing and if there were any structured team workouts at that time. Reggie said he has always worked out even though weightlifting was taboo at that time for sports. It Was Popular In Sports. He had been an avid weightlifter all his life. There were no off-season programs for athletes of that era. Ballplayers came to camp and played themselves into shape. Man how times have changed. What is the best workout program for baseball players? The baseball season is quickly approaching so we have some great workouts & programs specifically tailored for those athletes. Monica also asked him about his diet and he said he has always kept his protein up and ate clean. The man was way ahead of his time! Reggie&apos;s workouts are still a thing to behold, though injuries and age (sorry again) are taking their toll. The days of bench pressing 405lbs for reps and squatting 315lbs for sets of 20 may be over. Even with a disintegrated disk and bad shoulders Reggie still throws the weights around. He still easily handles 80lb dumbbells in chest movements. I&apos;m sure he could do more if he wanted but what would be the point. He handles equally impressive weight in other upper body exercises. Again remember he is 60! He no longer squats but does quad and hamstring work to keep things in balance. He also does large amounts of work with fit-balls or whatever ya call &apos;em. Remember I&apos;m a powerlifter; they&apos;re all balls to me. He also does a lot of core work with medicine balls. Do they still call them that? Or is there a newfangled name for them also? ... again balls!!! I wrote this article to show you how I feel about my friend Reggie Jackson! Rob has an interest in all aspects of sports and fitness training. He is a strongman, bodybuilding competitor and football player.